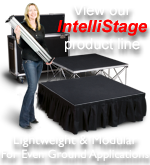 The All Terrain Stage Leg Extension is the core component of the Stage Leg Assembly that allows the legs to be height adjustable. 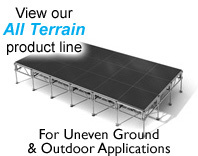 The All Terrain Extensions allow a stage to be set up from 24-40” high. 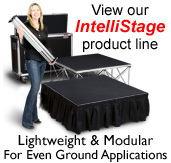 The Stage Leg Extension is not a required component, but Leg Assemblies will not be capable of being height adjustable and will be limited to 24 inches high.